Get the specialty HHO supplies you need, from one source, wholesale, or retail! The concept of separating hydrogen, and oxygen, from water, for use as a fuel additive to gasoline, is now out of the bag, and will not be forgotten! Thousands of people around the world, are creating their own HHO devices, in their kitchens, and small workshops, but they do not have adequate supplies of specialty items needed. Big box stores like Home Depot, Lowes, or others, do not stock large enough supplies of specialty items such as nylon hose barbs, nylon spacer washers, or nylon fasteners. They do not sell 304L, or 316L stainless steel bolts, either with a shank, or threaded all the way! They do not sell 304L, or 316L grade stainless steel plates! We strive to stock items specially used in HHO generators, which do not cause corrosian through dissimilar alloys, and which are almost specific, to the HHO field. As an example, there is much talk of the proper use of 304 grade stainless steel plates vs. 316L grade stainless. Both 304, and 316 alloys are also available, in the L grade, which stands for low carbon content. Low carbon content reduces the possibility of corrosion, especially when intentionally submitted, to electrolysis! Yet people spend great sums of money to purchase the best grades of plates elsewhere, and then connect them with far inferior bolts, or even use copper wires, to connect plates. We litterally see thousands of HHO generators that are put together, using stainless steel switch plates (which are only plated with stainless), and also set ups that connect using aluminum, or copper wires. This scenerio actually invites an explosion! It's because the big box stores do not carry specialty fasteners, in specific metal grades, and the companies that do sell these items sell bulk supply only! Instead of the proper parts, people settle for what they can get, and sometimes, they get hurt in the process! The same applies to distributors of stainless steel sheet goods. They deal in bulk orders, if you are to get good prices, and they do not sell stainless grade fasteners! 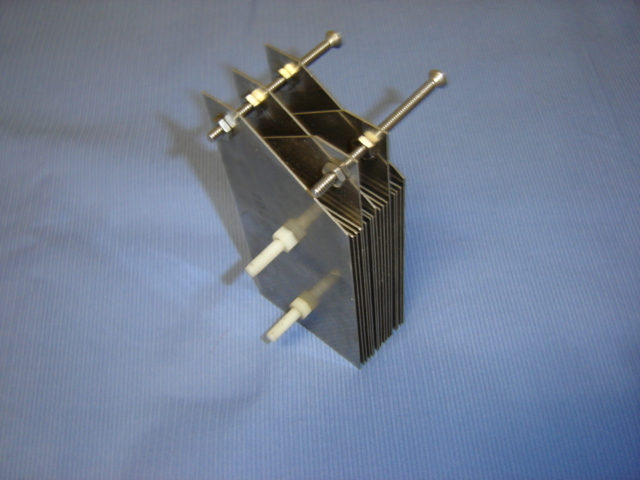 Using a good grade stainless plate, and connecting current, with anything other than the same grade material, is looking for an explosion! We can supply you with pre-cut L grade plates, of either 316 or 304 alloys, and matching grade stainless steel hardware. We also supply hose barbs, and various other nylon items such as nuts, bolts, spacers, etc. This plate design sells for $38.00 each wholesale! Above is a 304L grade, 17 plate design (22 gage), which has 16 cell gaps. Each plate is separated by an approximate 1.1 mm nylon spacer (0.0445" to be more precise). Plates are 6.5" by 3", with all neutral plates, 4.5" by 3". Design fits inside a 4" cylinder, with room to spare. The $39.00 ea wholesale price, is reserved for 304 L grade (minimum orders of 100 units), while we also sell this item for $59.00 each retail. 316L grade plates (same design) run $53.00 wholesale, and $79.00 ea. retail. Each is supported by matching grade stainless steel nuts, and bolts for assembly. That price is roughly equivilant to what you would pay for comparable raw materials! Used with Sodium hydroxide, this set up can produce .9 LPM, at a current under 25 Amps, after proper preperation, and burn in. Several units can be used (wired in parallel) and produse far more HHO than you need, even at a lesser ratio of catalyst, and input amperage. The cell reflects the image of parallel plates, as they have been cross sanded, to break surface tension of the hydrogen bubbles. The shine reflects, like a mirror! We have O2 extenders, to set the oxygen sensor sensor device slightly back, away from the exhaust manifolds airstream. O2 Extenders, as little as $1.50 each, in 100 unit bulk. They also retail, for $3.50 ea, plus shipping. Note that these devices usually sell for anywhere from $5.00 to $9.00 each on e-bay, plus shipping cost!